We rarely talk about the effects of humidity levels and how this affects contaminates and indoor air quality… and you should be worried! 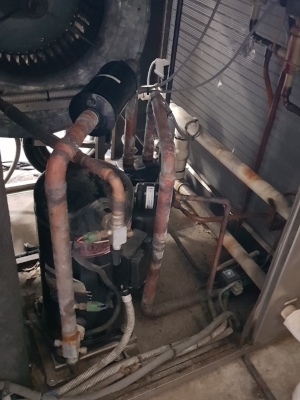 The most widely used form of waste heat recovery is: the process of recovering the waste heat from an air conditioning or refrigeration compressor condenser loop or the hot refrigerant before it goes to the condenser coil. Is it time to replace your swimming pool dehumidifier? Signs that your pool dehumidifier may need to be replaced and why “not replacing” an older dehumidifier could result in potentially costly damage to your facility. A typical dehumidifier is a hardworking unit in a harsh environment. It’s built to do a tough job. Dehumidifiers used in swimming pool applications generally have a working life of eleven to fifteen years. Dehumidification systems can provide great service for longer periods of time, we have seen many that have lasted eighteen to twenty years with good maintenance and servicing programs. The main purpose of a pool dehumidifier is to protect the pool structure from mould and corrosion. In fact, the moisture evaporated from the pool, could over time compromise the buildings structural integrity and make the pool environment unsanitary. What kind of damage can excess humidity cause? Too much humidity in the enclosure can lead to rust and corrosion, which can attack both structure and the equipment within the enclosure. Moisture in the air can also carry corrosive chemicals from the pool water. These chemicals can and do attack exposed metal surfaces, including ceiling grids, mechanical and electrical parts, and fixtures. Excess humidity can lead to moisture build-up in the walls and ceiling resulting in the formation of mould and mildew. If left untreated, it may eventually require replacing the walls and ceiling in the enclosure. Why would we keep a dehumidifier in operation when it becomes unreliable and continually needs repairs? Often times, we are afraid that it will cost too much to replace or that there isn’t a replacement dehumidifier available. The price that you pay for not replacing an older dehumidification unit (in terms of damage to equipment and facilities, as well as customer dissatisfaction) can actually outweigh the cost of replacing the dehumidification system. You are experiencing more than one or two service calls a year. An excessive number of service calls could be a sign of a worn dehumidifier, or of an inadequate preventive maintenance program. The dehumidifier runs continually or short cycles. A dehumidifier that is adequate for the duty should not run continuously. Continued short cycling of the dehumidifier may reduce the service life. This may be a sign that the unit is malfunctioning. The unit fails to reach the humidity and temperature of the room to the required set points. If the dehumidifier is not controlling the humidity and temperature as required, it may not be doing its job. Moisture is visible on exposed glass and metal surfaces. Visible moisture is a sign that the humidity in the room may be too high. This could be a sign that the unit is not working properly. A persistent smell of mould is present in the facility. If your dehumidifier is not performing properly, moisture may build up inside the walls and ceiling, providing mould with exactly the kind of cold, humid, dark environment that allows it to thrive. Once mould sets in, it becomes difficult to eliminate. Humiscope exhibited at ARBS 2018 at the ICC Sydney in May!